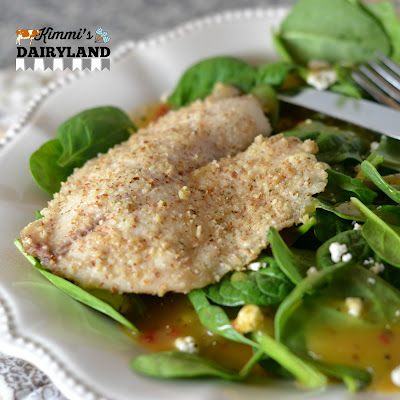 If you are looking for a dinner option that is light, filling and delicious, you'll want to add this Almond Crusted Tilapia to your menu rotation. Many people create New Years Resolutions each year and many of those go out the window before January is over. Especially those weight loss and fitness goals. If losing a few pounds is on your 'To Do' list this year, check out my weight loss series here. Losing weight is HARD. There is no short cut and no quick fix. It takes time, patience and a lot of perseverance. Last year, I lost 30 pounds. I wanted to increase my energy and more importantly, my confidence. I'd struggled with my weight on and off since I was 8 years old and it took more than 20 years to find the real secret to losing weight. Now I'm down to the last few pounds and onto the lifelong journey of maintaining it. Like I said, no quick fix. While exercise is a necessary component of a healthy lifestyle, about 80 percent of the battle is nutrition. Planning meals ahead of time gives you more control of what you are eating and also saves you money at the grocery store since you are only buying ingredients you actually need. 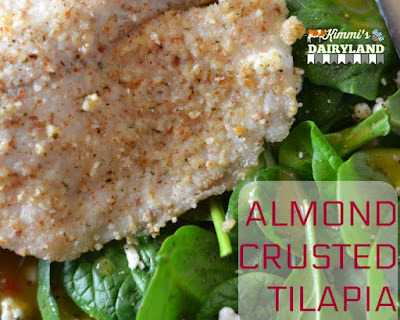 If you don't have a food processor, you can use a blender or similar device to chop the almonds. Broil fish on high until crust is crispy and a golden brown. Check on it regularly to prevent it from burning or drying out. After 5-7 minutes, I start checking on it every two minutes.